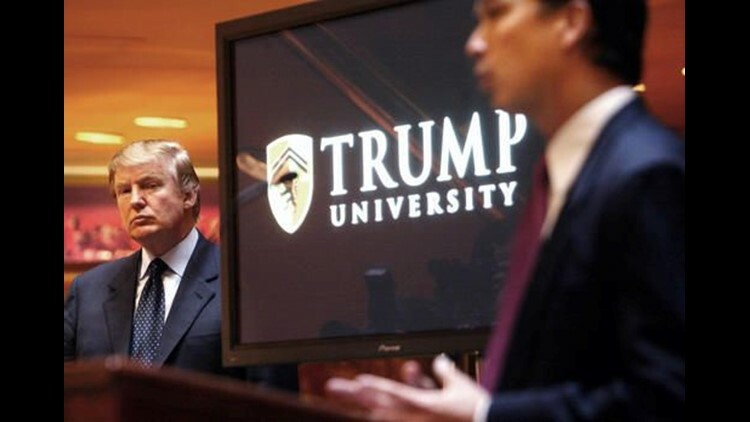 On Friday, U.S. District Judge Gonzalo Curiel will consider Makaeff's request to withdraw from a lawsuit that says Trump University seminars and instruction fleeced students with unfilled promises to teach the secrets of real estate success. Her attorneys say Trump and his lawyers have put her "through the wringer." Trump called her a "horrible, horrible witness" at a rally in Arkansas last month. On social media this week, his one-word characterization of her request to withdraw — "Disgraceful!" — was retweeted more than 3,200 times. Trump's attorneys say the lawsuit should be dismissed if Makaeff is allowed to withdraw, arguing that their trial strategy centers on her. They identify her as "the critical witness." Makaeff didn't imagine she would be subjected to criticism under the glare of a presidential campaign, her attorneys say. She has been deposed for a total of nearly 16 hours and suffered anxiety about finances after Trump sued her for defamation, seeking $1 million. Makaeff eventually prevailed on the defamation claim, and a judge ordered Trump last year to pay $798,779 in her legal fees. The skirmish in one of three lawsuits against Trump University comes as the case nears trial, possibly this summer. A trial date has not been set, but a final pretrial conference is scheduled for May 6 and Trump appears on a list of defense witnesses who may testify at the trial. Trump's attorneys wrote that Makaeff gave the instruction high marks in surveys and "simply did not put in the time, work, and perseverance necessary to achieve success." Makaeff's attorneys say the yoga instructor was unaware of Trump's "false advertising" when she completed the surveys and didn't want to risk alienating anyone who might advance her career. The 9th U.S. Circuit Court of Appeals sided with Makaeff on the surveys when considering Trump's defamation claim in 2013, saying, "As the recent Ponzi-scheme scandals involving onetime financial luminaries like Bernard Madoff and Allen Stanford demonstrate, victims of con artists often sing the praises of their victimizers until the moment they realize they have been fleeced." Reminded of the Madoff comparison during a recent debate, Trump said, "Give me a break. You know what? Let's see what happens in court."